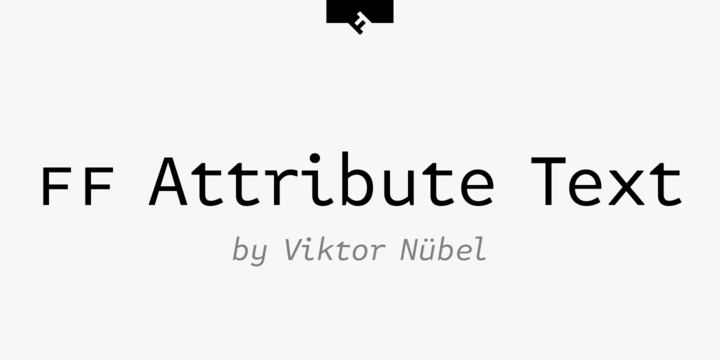 FF Attribute Text is a typeface created by Viktor Nübel and published by FontFont which has proportional design. It is available in 7 weights (from Thin to Black) and italics, useful OpenType features and language support. At first glance looks monospaced, but is not. It merge well with FF Attribute Mono. Also is ideal for communication purpose, programming, branding etc. Enjoy! Note: “Attribute” is a trademark of Monotype GmbH and may be registered in certain jurisdictions. FF is a trademark of Monotype GmbH registered in the U.S. Patent and Trademark Office and may be registered in certain other jurisdictions. A font description published on Monday, January 8th, 2018 in FontFont, Fonts, Viktor Nubel by Alexandra that has 751 views.